ASC is pleased to announce the recipient of the 2016 Lifetime Achievement Award, Jim Goddard. For more than four decades, Jim has been a leader in shaping construction education to improve both the construction industry and the lives of the students he has touched. A faculty member at Kansas State University, since September of 1972, in the department of Architectural Engineering and Construction Science, Professor Goddard has been integral in advising undergraduate students, coaching student competition teams, and serving as a faculty sponsor for numerous construction organization including the Associated General Contractors (AGC), American Institute of Construction (AIC), and Sigma Lambda Chi (SLX).Jim’s work with professional organizations to improve construction education is immeasurable. He has held numerous leadership roles with the American Concrete Institute (ACI) including serving on the Board of Directors and as President for the Kansas Chapter. Jim has served SLX on its Board of Directors and in the roles of both President and Secretary/Treasurer. As an active member of ASC, Jim served at both the regional and national levels. He has been an ASC Region 4 Director, a Region 4 Competition Coordinator, and a national Secretary, Vice-President, and President. Perhaps his greatest contribution has come in his service, commitment, and leadership to construction education and accreditation. 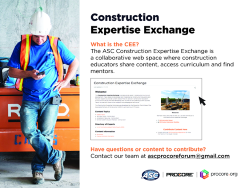 He has held 13 different roles with the American Council for Construction Education (ACCE) dating back to 1987 including multiple committee chair positions, Vice-President, President, and Board of Trustees member. Jim has changed the construction industry and inspired hundreds of students to be leaders in the industry. His record of scholarship, service, education, and professional involvement represent a model for other construction faculty across the globe to emulate. One construction industry member stated, “Jim is passionate about insuring that the construction industry is well represented by knowledgeable, skilled, and ethical men and women that build our nations buildings, and it shows in his individual dedication”. ASC congratulates Jim on this award.